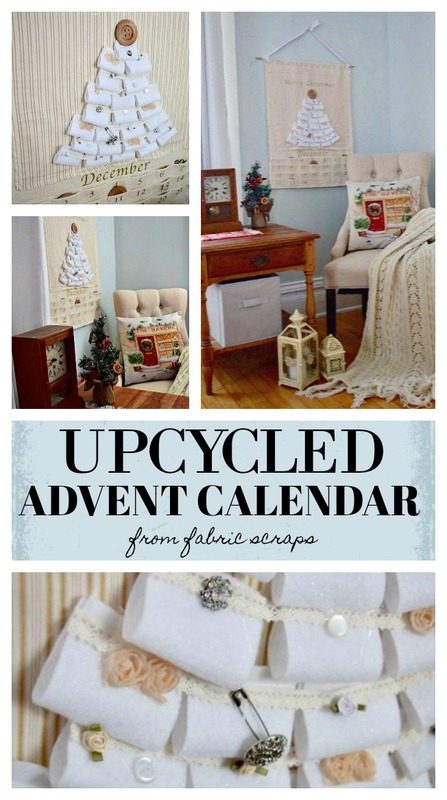 We adore a good project that uses items we already have and scraps. 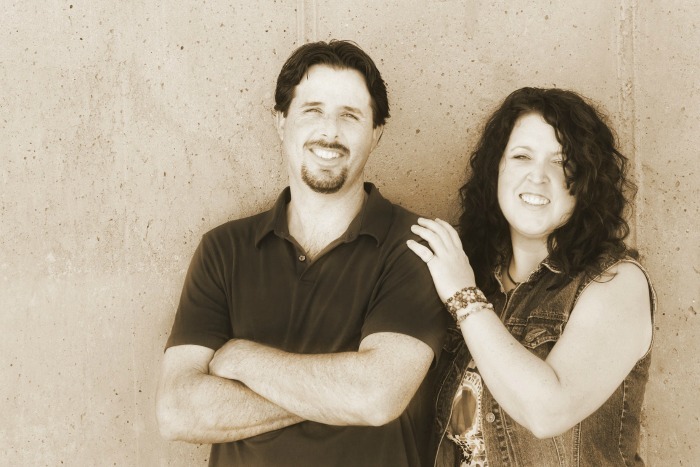 Today, our good friend Jessica from Cozy Traditional Home is sharing this…. Christmas is Advent season and what better way to celebrate than with little treats? We have used an Advent calendar each year in our home for many years. Now that our kids are grown, there really isn’t any need, but I love traditions and I can’t do without this one! 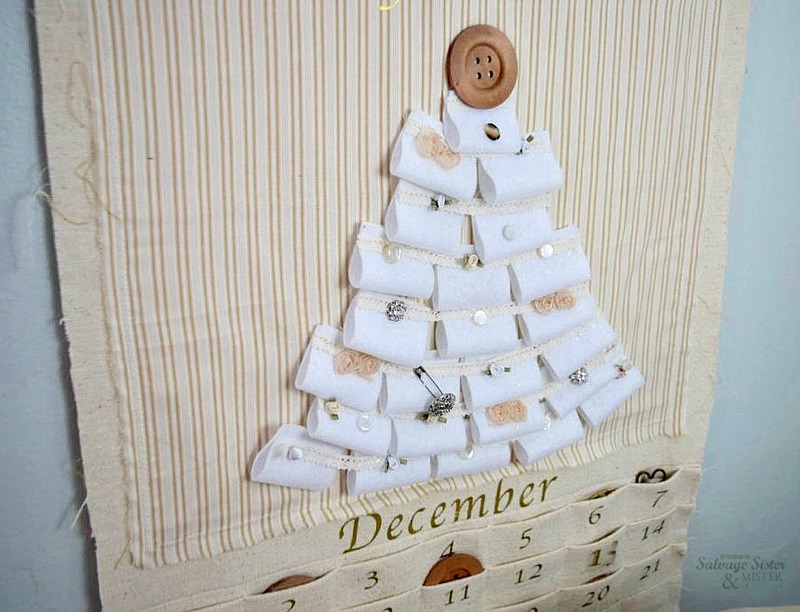 It’s so much fun to look forward to pinning a new treasure on the Advent calendar each day! This project is made completely from scraps of fabric, leftover trims, ribbons, bows, buttons and pretty little things that would otherwise stay in a drawer and never see the light of day. The calendar words and numbers are cut Heat Transfer Vinyl, made on the Cricut Maker, and applied with the Easy Press 2 heat press. *Affiliate links used which will show the same or similar items used. Please see our disclosure policy here. 1. First, trim the canvas to 24″ square. 2. Fold up and pleat bottom section into 4 rows of 2″ deep pleats. Pin in place, sew vertically from top of pleats to bottom edge to form pockets for keeping treasures for each day. 3. Cut the numbers and lettering on your Cricut Maker or cut them out by hand and glue them in place. You can get my Cricut Maker file here that has all the designs you need ready for cutting. 4. Weed out excess vinyl from the letters/numbers, leaving the plastic backing intact. Trim away extra plastic, and place each number in right side up on pockets. Press with a Heat Press or iron for 30 seconds on both sides to adhere. Remove plastic backing. Repeat for wording at top of calendar and month, as desired. 5. Next, cut felt strips into 2 1/2″ x 4″ long pieces. Fold in half and sew a straight stitch along top edge of each piece to hold them together. Hot Glue pieces in place for the tree, starting at the bottom and working your way to the top, overlapping as you go. 6. Add lace trim to each section cutting it to length and using the hot glue to hold it in place. Then add random buttons, bows etc. on top of the lace until the tree has the desired look. 7. Put a button on a ribbon, rhinestone buttons with safety pins, small ornaments or candies in each pocket for each day. Pin them on the tree using safety pins throughout the month. 8. Stitch a channel to insert the dowel for hanging, 1″ wide along top edge of canvas. 9. 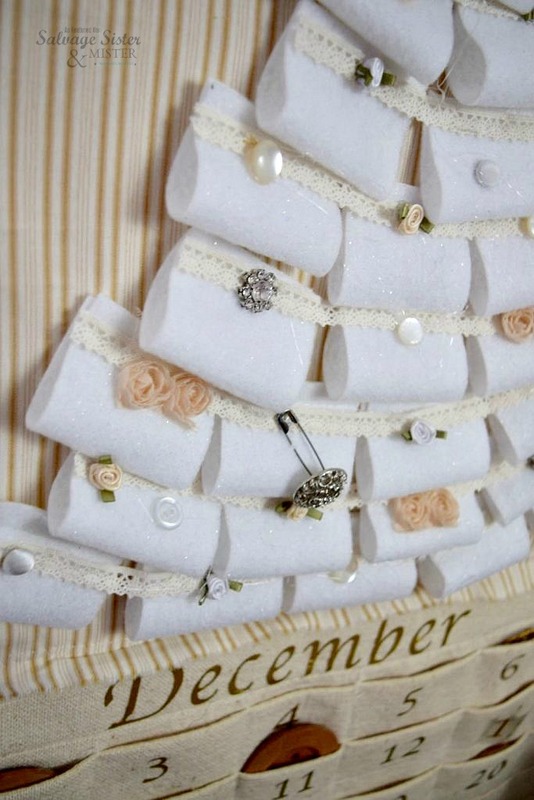 Finally, thread the calendar on to a wooden dowel and hang with a pretty ribbon. I prefer raw unfinished edges to create a rustic look. You can certainly finish them if you prefer. There is no need to close the pockets at the top, but you could use a safety pin on each one to secure them if you have little ones at home who might get into things. 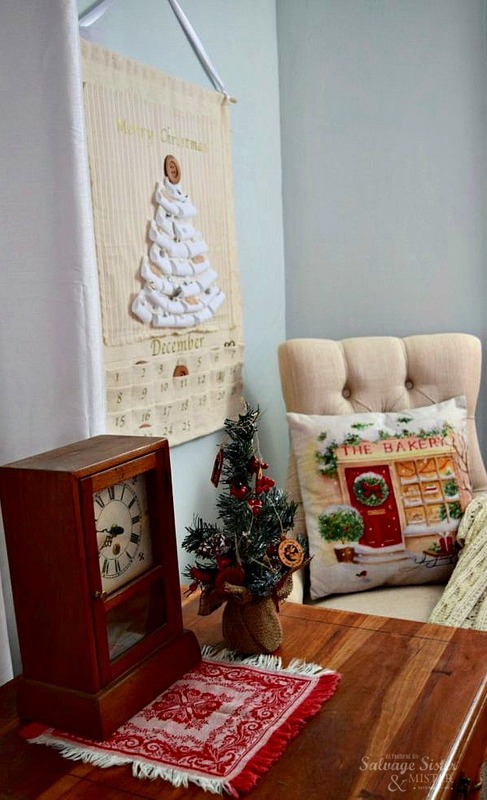 To store the calendar, remove from the wall and simply roll around the wooden dowel. We had a calendar like this growing up and it lasted for many years. If you do not have a Cricut Maker to mark the month and days, try a fabric paint pen in gold or a Sharpie Marker instead. 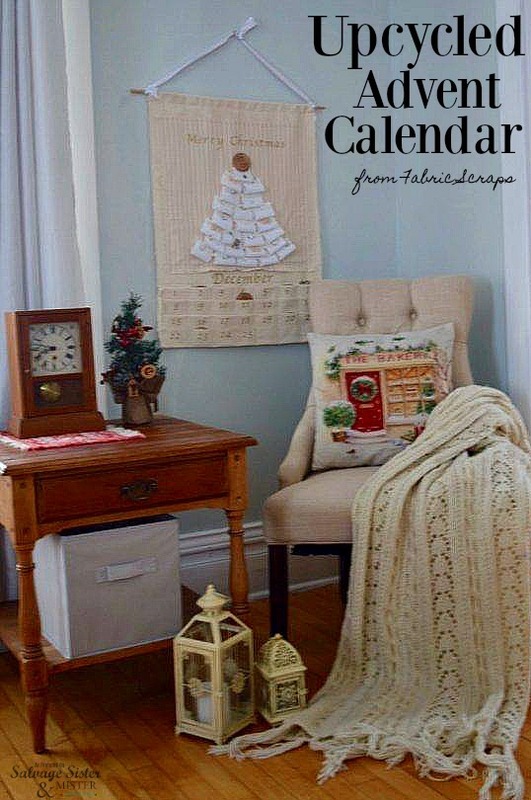 A BIG Thank you to Jessica for sharing this wonderful calendar!!!!!!! And, if you use an advent calendar, we would love to know the story behind yours. This is so pretty and vintage looking. I love the soft colours as well. Thanks Leanna! I love the soft colors as well.